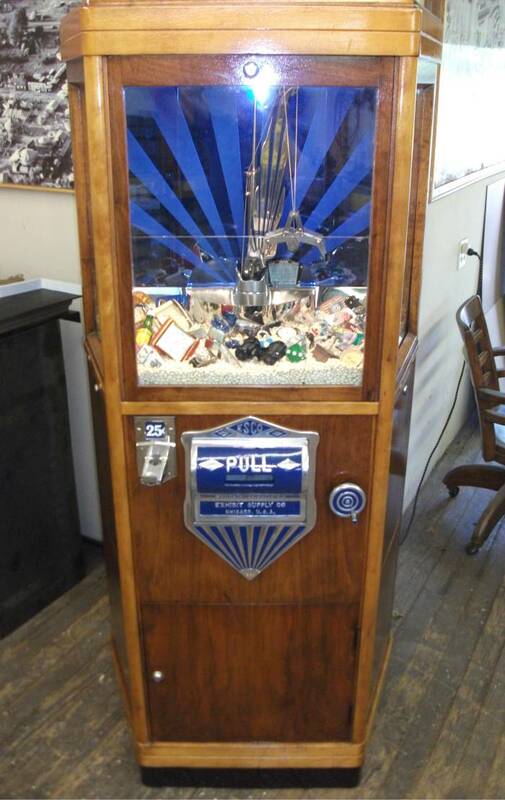 Consider adding this old style crane digger game to your home game room, Pinball collection, office, or retail location. 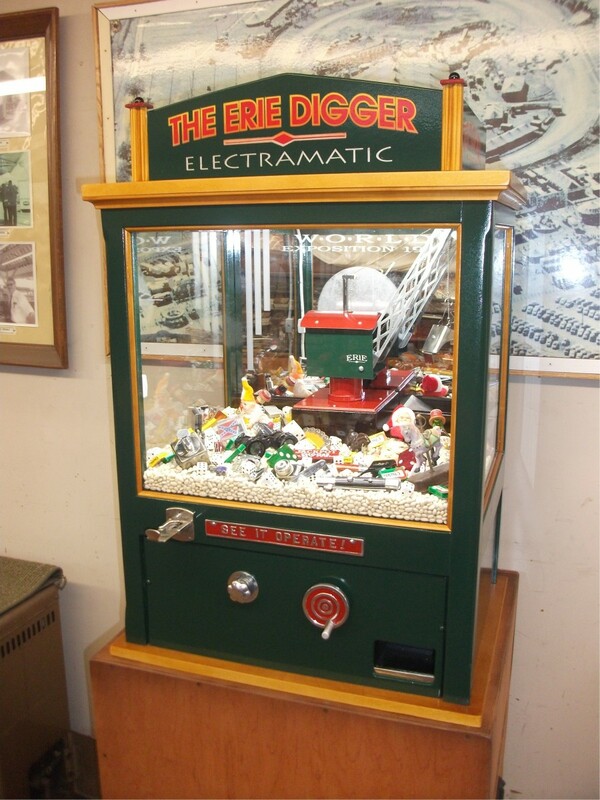 This Erie Digger "Electramatic" is one is the best looking and most dependable you will ever find at a reasonable price from a reputable seller. .The cabinet is in fresh high-gloss British Green enamel with polished trim parts and lacquered birch trim. The mechanical/electrical mechanism is virtually new, having a new motor, switches, wiring, chains, and parts. It is guaranteed for life 100% for parts and labor. The digger displays beautifully and plays wonderfully.Click on image for complete details. 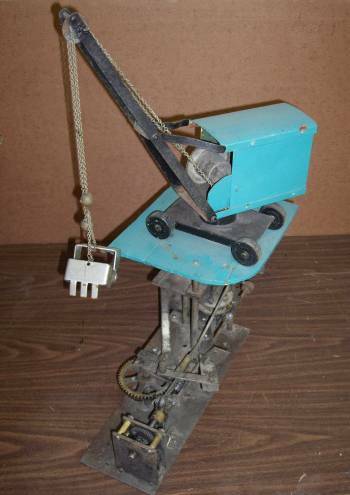 This is a beautiful example of the historic Electramatic Erie DiggerThe mechanical/electrical mechanism of this Erie Digger Electramatic’ model is virtually new, having a new motor, switches, wiring, chains, and parts. It is guaranteed for life 100% for parts and labor.The digger displays and plays wonderfully! It is a meticulously detailed example finished in hand-rubbed walnut and lacquered birch trim with polished and plated detail parts. The pictures I take with a pocket camera do not do the offering justice. Email request for direct images.This is a unique model which has the desirable “Skill Knob” feature: Twist the dial to position the claw In-and-Out, while using the larger turning handle to locate the claw position Left-to-Right. 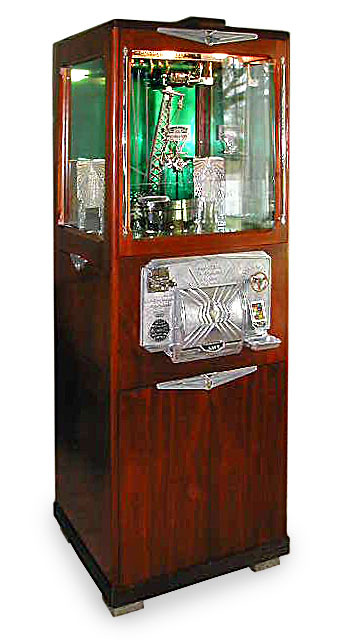 These combined positioning controls result in much more player control and satisfaction than the standard Erie Digger.The coin slide is the correct, 3- bolt, 25c Heath, for a quarter play, which was the standard in the 1930s-50s era for a ‘Casino Model’, and also makes the digger commercial-ready for operation in a place of business if wanted.The merchandise shown in some images is meant to demonstrate how the digger looked when dressed as per the 1930s-70s for grownups to play at country club and night club casino venues right along side 3-reel slot machines. 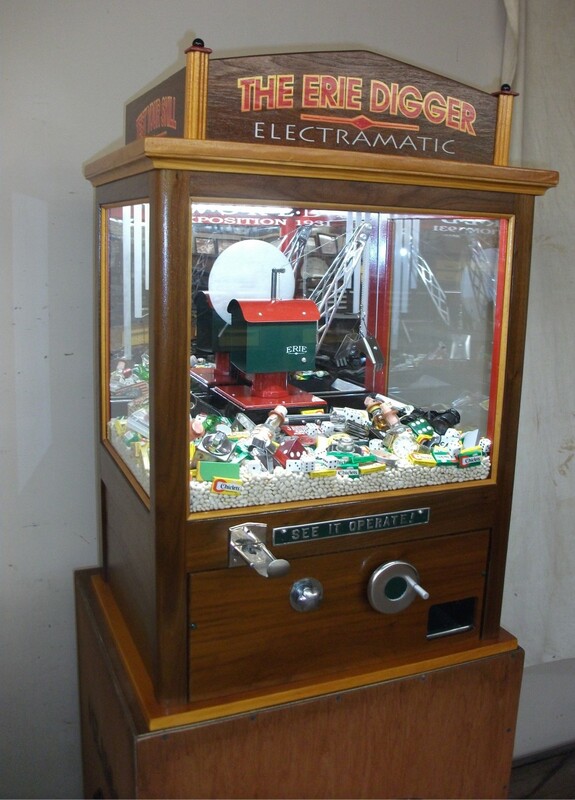 The antique vintage merchandise shown can not be included with the price, but assortments are available.A special replica shipping crate which can serve as a stand is included (see images)Shipping options are for a premium motor carrier. A tracking number and tracking link will be provided by email along with an instruction sheet for unpacking and set-up of the digger.Shipping options:#1 is flat rate $145. to a verifiable business address in the continental U.S.#2 is flat rate $160. to a terminal near you for customer pick-up (send me your zip code for the location of your nearest terminal)#3 is residential delivery to your door for $225., and a phone contact number is required.When purchasing give your preferred shipping method and I will send a separate PayPal invoice for the flat rate cost.All questions answered by email. 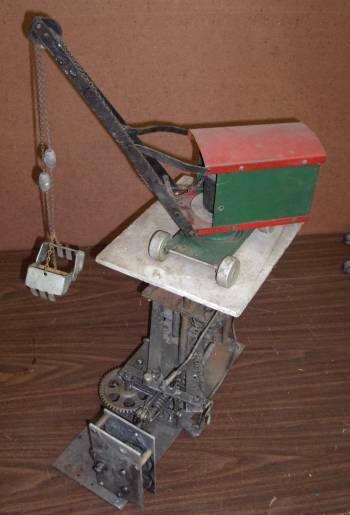 The mechanical/electrical mechanism of this Erie Digger ‘Electramatic’ model is virtually new, having a new motor, switches, wiring, chains, and parts. It is guaranteed for life 100% for parts and labor.The digger displays and plays wonderfully! It is a meticulously detailed example in hand-rubbed walnut finish with polished and plated trim.This is the unique model which has the desirable “Skill Knob” feature: Twist the dial to position the claw In-and-Out, while using the larger turning handle to locate the claw position Left-to-Right. 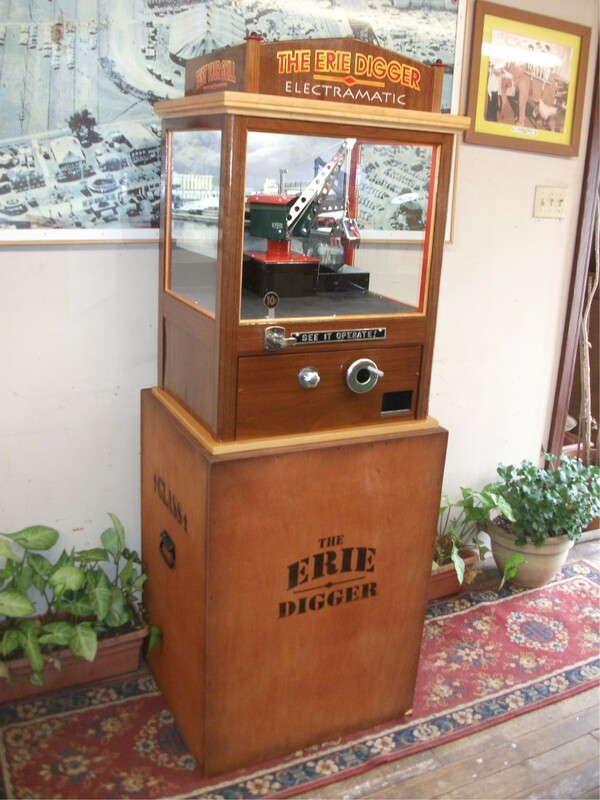 These combined positioning controls result in much more player control and satisfaction than the standard Erie Digger.The coin slide is the correct, 3- bolt, 10c ABT, for one dime per play, which was the standard in the 1950s-70s era. (This can be upgraded to 25c play before shipping for an additional service charge. 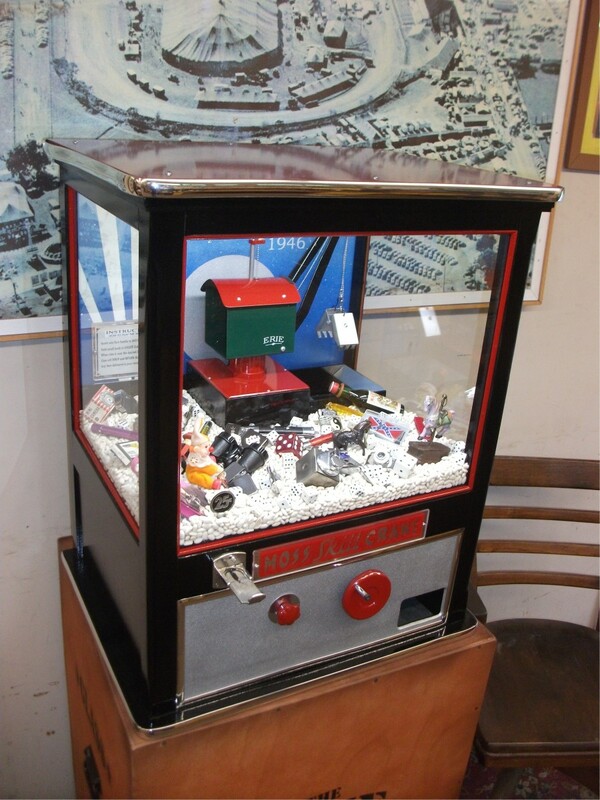 )The antique merchandise shown in some images is meant to demonstrate how the digger looked when dressed as per the 1940s-70s, and can not be included with the price, but assortments are available.A special replica shipping crate which can serve as a stand is included (see images)Shipping will be by a motor carrier. A tracking number and tracking link will be provided by email along with an instruction sheet for unpacking and set-up of the digger.Shipping in the special decorative crate is flat rate $145. to a verifiable business address, or a nearby terminal for pickup in the continental U.S. Residential delivery is an added $85. fee.